The Post. What a fantastic movie on so many levels! I saw it recently with my family and, except for someone who kept falling asleep and snoring behind us, we really enjoyed this truly inspiring movie. The actual events surrounding the Pentagon Papers and the Vietnam conflicts here at home all flooded back to mind (yes, I am that old). But the movie brought in more detail and information than I ever knew. It filled the theater with suspense despite knowing the ultimate outcome. It reminded me again of just how vulnerable our First Amendment rights are, and how easy it is for an administration of government to take them away. The U.S. Constitution doesn’t actually grant us our rights, it is just a slip of paper. Rather, it challenges us to physically inhabit those rights for ourselves. It lays the framework for an active civic process. Each generation must secure their rights anew under our Constitutional framework. It was twice said in the movie that the right to publish the news is secured by publishing it, not by arguing about it. Our rights can wither in debate but can only strengthen when exercised. That is a lesson we must pass along to every generation. Two present day examples of this principle come to mind. NFL players kneeling during the National Anthem is an actual exercise of our First Amendment rights, while the ensuing debate did little to strengthen our right to protest. A second example comes from a local news story of a lawyer who was stopped in her car by a police officer. The officer asked her if she knew why he had stopped her. She said she refused to answer the question, but otherwise cooperated and gave him her documents. The officer was so upset that she wouldn’t answer his question that he arrested her for not following a “legal” command. As he put her in the back of his police car he read her that familiar Miranda warning, which says in part, “You have a right to remain silent…” She remained under arrest for hours before being released. She later won a modest settlement in a suit brought against the Department for her unlawful arrest. The story generated a lot of debate while her actions helped secure our actual rights. But back to the movie. I also came away with a profound appreciation for the incredible heroine depicted so well by Meryl Streep. Katharine Graham was a socialite and heiress to the Washington Post, which was a local newspaper at that time. Her father founded the paper and left her husband in charge. Then her husband died suddenly leaving all of this crushing responsibility for the newspaper on her. Ms. Graham was ill prepared for her role as publisher in most aspects. But she had an incredibly noble character and somehow managed to summon enormous strength to do the right thing under threats of disaster. She was a woman alone in a man’s world, yet she rose to meet the challenges. Her courage saved the Post and helped save the First Amendment for a generation to come. Her decision to publish the stolen, top secret Pentagon Papers exposed decades of government lies about Vietnam and helped bring that war to an end. The Supreme Court’s decision to uphold the freedom of the press in publishing that information set the stage for journalism’s victory in holding the Nixon administration accountable to the rule of law following the Watergate break in. Contrast that with how the government is acting in the Edward Snowden matter today, for example, consider the public good Snowden has done in exposing illegal, unconstitutional government activities. His decision to selectively reveal classified information to the press has lead to strong government reforms designed to protect our privacy rights, yet he is considered a criminal, just as Daniel Ellsberg was a generation ago. At a time when our current President openly lies to us, disparages the free press, calls it “fake news” and encourages citizens to distrust not only legitimate journalism but many trusted government institutions, this story about Publisher Katharine Graham, her Editor-in-Chief, Ben Bradley and the Washington Post is a timely tale of caution and inspiration for us all. It all began with a conversation on Facebook with a conservative friend of mine and ardent Trump supporter. I had posted an article about Erik Prince. He is the founder of Blackwater, a solders for hire firm that is also providing very militarized training programs for our domestic police departments. I was surprised to learn that Betsy DeVos was his sister. The story is about him being a quiet Trump advisor. My friend immediate responded with a link to FakeNewsChecker.com that lists Democracy Now as a fake news site. I went to the FakeNewsChecker site for myself and saw that it lists perhaps hundreds of new sites as “fake news” sites. I was suspicious about this site as I am confident that Democracy Now, while progressive in its editorial decisions, present fully accurate, verifiable information. Also overdue, is a discussion of what makes news “fake” news. In my view it is willfully false information presented as news either for profit or propaganda. It isn’t mistakes in reporting or accurate reporting, but selective reporting. It isn’t obviously intended satire either. What follows it our Facebook discussion and my findings about the rise of fake, fake news checker sites here and abroad. Democracy Now has been added to the growing list of untrustworthy and fake news sources. Me: Thank you for sharing this. I. Was unaware until now that there was a fake, fake news reporting site. Democracy now is Progressive in terms of its editorial content but it is one of the most respected news sites on the web for its accuracy in reporting. Friend : Again, We have to agree to disagree. ME: your discovery of the Fakenewschecker site and it’s obvious flaws lead me to do some checking of my own. First you will notice that there is no ownership information or “about us” menu on the Fakenewschecker.com website. This is a sure sign that the owners want to remain anonymous, not a good thing for a site that claims to check facts. There are no links or statements or any other evidence of an attempt at transparency. There is no discussion of what criteria or process the site uses to make hits findings. There are no references to source material used. Next I learned that fake news checker sites are popping up in other countries lately. There is growing concern around the world that this may be a coordinated attempt to undermine confidence in news gathering. There is some evidence in Europe linking these sites to Russia (See a portion of an article below). Then I looked the domain up on WhoIs.com. The site was only created on November 17, 2016. This is very recent. The time it would take to thoroughly vet the content of so many “fake news” sights far exceeds the three month window that the website has been active. 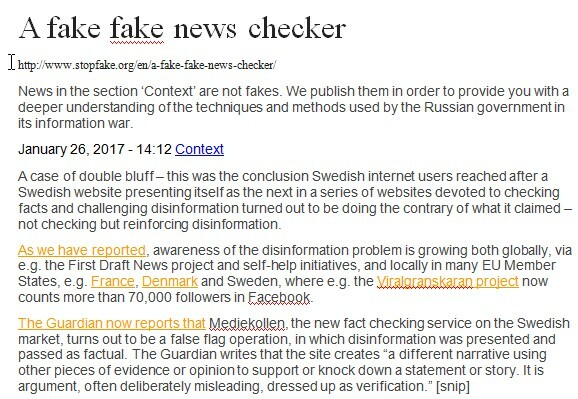 Finally, you will notice that the registrar for “FAKENEWSCHECKER.COM” is 1&1 INTERNET SE. When you go to this registrar’s website (http://registrar.1and1.info) you discover that the site is registered in Germany or Austria. Check out the flags below for 1&1 Internet SE. The first is Germany and the second is Austria. When you go to these sites the writing is all German. This is odd in my opinion because the owners are both secret and foreign based. I don’t have the skills or resources to track this suspicions that this is a Russian cyber-op, but I wouldn’t put much faith in the veracity of this site. Below is a clip from an article on the recent appearance of fake, fake news checker sites.